VSA coordinates the operation of multiple devices, simultaneously over any combination of serial, parallel, USB, audio, and video interfaces. Below are several examples of system setups which will help you discover how VSA can work in your production. Please visit the hardware manufacturer's website for details on how to properly configure the hardware to work in the illustrated configurations. Example 1. In this example, VSA is controlling 8 MiniSSC-compatible servos, 1 DC motor via the Pololu Jrk controller, 56 SSC32U servos, 8 SSC32U relays, 8 LPT relays, 4 DMX 20-Amp stage lights, and 1 DMX X-Y scanning spot light. Notice that up to the maximum number of devices can be connected to any one port. For example, using VSA Hobbyist, as many as 128 MiniSSC devices could be connected on COM1. Also note that in this configuration, the RAPU is acting as a "repeater" and retransmitting the MiniSSC-compatible TTL serial and DMX commands sent from the PC. The RAPU, the Velleman VM116/K8062, or the ENTTEC Open/Pro DMX USB is required to generate DMX output. Example 2. In this example, VSA is controlling servos, relays, and dimmers. 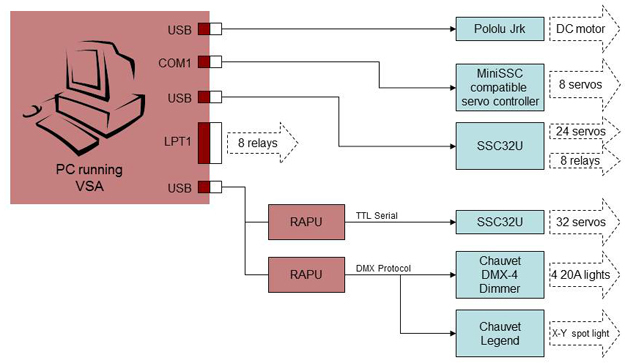 Notice that ports with compatible devices, for example the SSC32U and Maestro in MiniSSC emulation mode, can be combined on the TTL output of the RAPU. Example 3. In addition to the hardware configurations in the other examples, VSA can also control multiple audio output devices. 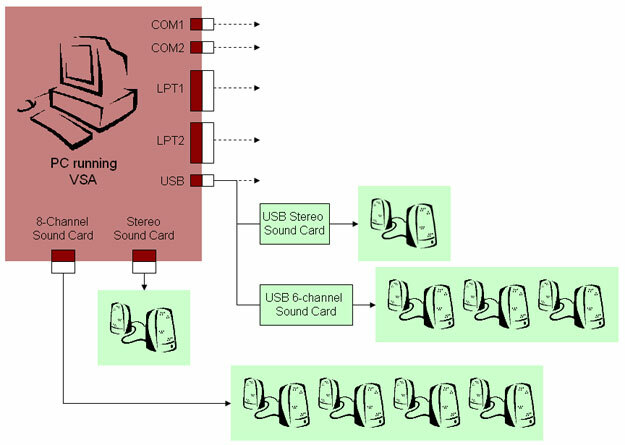 In this example, VSA is being used to control two internal sound cards and two external, USB sound cards. Each audio output device can play a different audio file. VSA will support up to 8 speakers on each channel (e.g., stereo, 5.1 and 7.1 audio). Example 4. VSA Professional and Ultimate can also synchronize video. 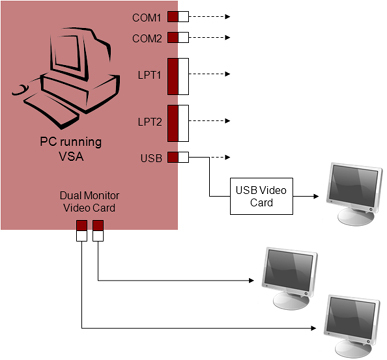 In this example, VSA is being used to control an internal video card and an external USB video card. Each video can be configured to play in full screen on a particular mointor or play in a window, taking up only a portion of a monitor. VSA officially supports the Microsoft RGB Raw AVI and XVid video formats.